Snow has fallen on the ski slopes at Canaan Valley Resort in the Alleghenies in northern West Virginia. 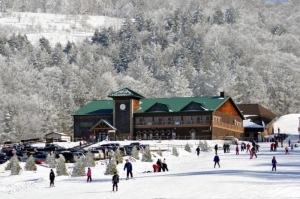 Winter has arrived in the Allegheny Mountains in northern West Virginia, and officials at Canaan Valley Resort are looking forward to opening the resort’s ski area in mid-December and its skating rink and snow-tubing park for Thanksgiving. Resort manager Steve Drumheller says the weather has cooperated and the resort is on track for traditionally wintry Thanksgiving, Christmas, and New Year’s celebrations. The resort’s 1,200-foot tubing park — one of the longest in the Mid-Atlantic — will open Thanksgiving Day, weather permitting, and remain open through Nov. 25. It will close midweek and reopen Saturdays and Sundays from 9 a.m. until 4:30 p.m. until Dec. 15, after which it will open full time for the season. Its covered outdoor ice-skating rink will open Thanksgiving Day and operate through the weekend from 11 a.m. until 6 p.m. It will afterwards open the weekends of Dec. 1–2 and Dec. 8- 9 from 9 a.m. to 4:30 p.m. and then open full-time for the season on Dec. 15. The resort’s annual Thanksgiving buffet this year features a traditional menu served in its Hickory Dining Room from 11 a.m. until 1 p.m. and 3 p.m. until 5 p.m. Reservations should be made by calling 304-866-4121, ext. 2651. The menu includes traditional items as well as culinary surprises and includes baked ham, braised pork tenderloin, roasted turkey, herbed-cornbread stuffing, oyster dressing, mashed red-skinned potatoes, cherry butter-glazed ham, candied sweet potatoes, and an array of holiday desserts. A full menu is available on the resort’s website. Thanksgiving vents include ice skating, snow tubing, drawing and pie-eating contests, crafts, and family games and movies. One of the quirkier events is “turkey bowling,” scheduled for 1:30 p.m. Friday in the ice rink, during which players “bowl” a frozen turkey down the ice and try to reach the “fowl” line while avoiding throwing “butterballs” (gutter balls). For more indoor fun, the resort boasts a spa, arcade, indoor pool, and fitness center. Santa and Mrs. Claus will host breakfast in the Hickory Dining Room Dec. 15 and 22 from 8:30 until 11:30 a.m. Children are encouraged to bring their wish lists, and parents, their cameras. The Hickory Dining Room will be serve a Christmas buffet from 3 until 9 p.m. Dec. 25 that will include prime rib, shrimp, and baked ham. What could be better than a full day of skiing, tubing, and skating followed by a New Year’s Eve buffet? Served from 5 to 10 p.m. in the Hickory Dining Room, the menu features chicken, salmon, and carved New York Strip as well as a dessert station. “Gabe Dixon & The Whiskey River Band” will perform in the resort’s Laurel Lounge while a family party will be celebrated elsewhere on the resort. Beautiful Canaan Valley Resort shelters in the highest mountain valley east of the Rockies. 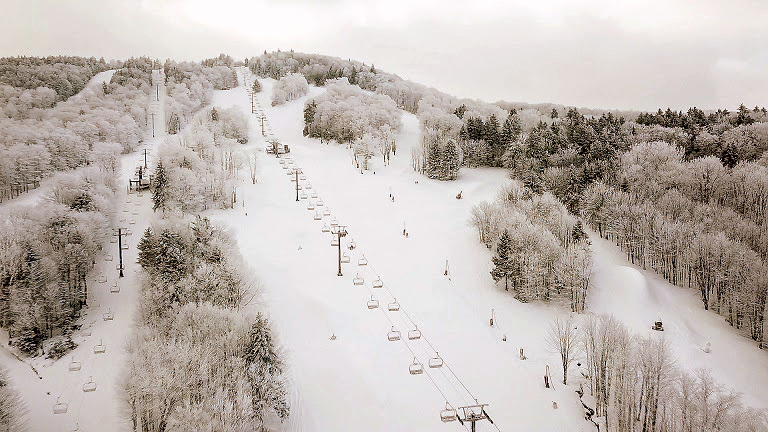 Its ski resort descends from Weiss Knob on Cabin Mountain at 4,280 feet above sea level and includes 47 trails and slopes, one quad lift, two triple lifts, and two magic carpets, as well as a terrain park and ski school. Its children’s slope and ski school for private and group lessons and adaptive skiing provides for a memorable winter adventure for every skier and snowboarder. Canaan Valley is a drive of approximately two hours from Washington, D.C., three hours from Pittsburgh, and less than three hours from Charleston, W. Va.
To reserve accommodations, visit CanaanResort.com or call 1-800-622-4121.